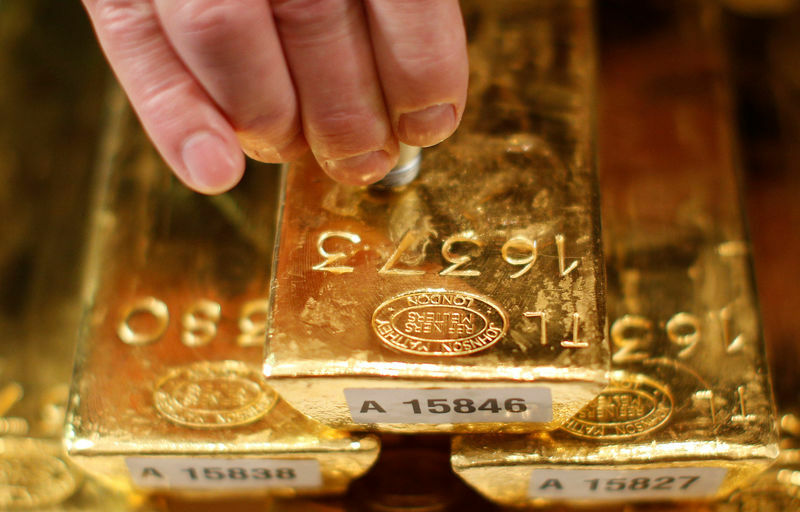 Investing.com – Gold prices look likely to remain under pressure this week as a combination of a stronger dollar and higher Treasury yields make the precious metal less attractive to investors. Gold has also struggled as its inverse relationship to the firmer dollar has outweighed safe haven demand. On Wednesday investors will get the chance to parse through the minutes of the Federal Reserve’s August meeting, when it left interest rates unchanged and indicated that it remains on track for additional rate hikes this year. Investors will be on the lookout for any tweaks to the Fed’s outlook on inflation, the economy and trade war fears. On Friday, Jerome Powell is to make his first appearance as Fed chairman at the annual economic symposium in . The conference will be closely scrutinized for clues to the monetary policy direction of some of the world’s most important central banks. Geopolitical risks will also remain in focus this week, with the U.S. expected to impose fresh sanctions on on Wednesday. On Thursday, Washington is expected to slap of Chinese imports, to which Beijing has threatened to retaliate in kind. Gold futures pushed higher on Friday, but still ended the week down 2.86%, the largest weekly decline since early May 2017. December settled up 0.66% at $1,191.80 on the Comex division of the New York Mercantile Exchange. On Thursday, prices settled at $1,176.20, the lowest level since early January 2017. Gold gained ground as the dollar fell against a currency basket, retreating from a 13-month high hit earlier in the week as worries over trade tensions between the U.S. and China eased. The , which measures the greenback’s strength against a basket of six major currencies, was down 0.50% at 96.00 late Friday, the largest one day decline in almost a month. Market sentiment was boosted by news that Beijing is set to resume with Washington this week, although at a lower level than previously. It will be the first round of trade talks since June and could be a step towards easing trade tensions between the world’s two largest economies. Gold prices are down around 10.8% so far this year, pressured lower by the stronger dollar and rising interest rates. Investors have also shunned the precious metal despite an escalation in global trade tensions, indicating that gold may be losing its safe haven status. Elsewhere in precious metals trading, settled up 0.42% at $14.775 a troy ounce, for a weekly loss of 4.26%. settled at $788.10, 0.46% higher for the day, to end the week up 0.91%. Among base metals, ended at $2.660, up 1.66% for the day, trimming its weekly loss to 3.95%. Atlanta Fed President Raphael Bostic is to speak at an event in Tennessee. The UK is to report on public sector borrowing figures. New Zealand is to report on retail sales. Later in the day, Canada is to publish retail sales figures. The U.S. is to produce data on existing home sales and the Fed is to publish the minutes of its August meeting. Central bankers and economists are to gather in Jackson Hole, Wyoming for the first day of a three day event. The U.S. is to release data on durable goods orders. Fed Chairman Jerome Powell is to speak at the Jackson Hole Symposium.